Major General William Graham, Jr., I Corps deputy commanding general, spoke to 30 tax preparers and honored guests at the opening ceremony of the new Joint Base Lewis-McChord Tax Center Jan. 15. The tax center, now located in Bldg. 6230 on Pierce Ave. on JBLM Main, is scheduled to open Jan. 28 at 8 a.m. and will provide free tax preparation for active-duty and retired servicemembers, activated Reserve and National Guard members and their families. Graham spoke to the servicemembers and guests about the importance of the tax center to the JBLM community. 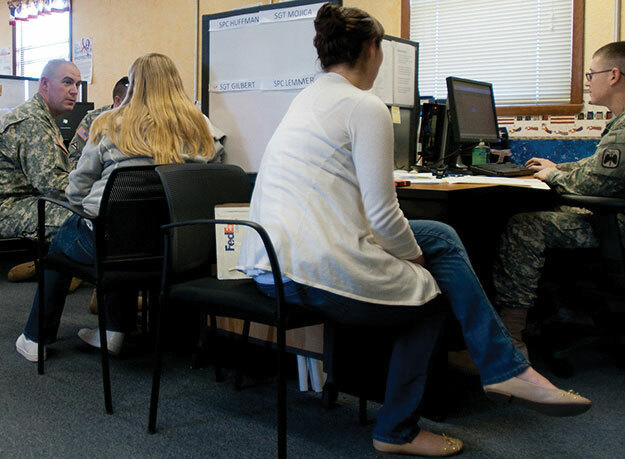 Last year, the tax center saved JBLM members more than $900,000 in fees and helped obtain more than $8,000,000 in refunds. This tax season will come with significant changes to the tax code that will affect many in the JBLM community. The Tax Cut and Jobs Act, which was passed in 2017, has radically changed the tax law. Any other relevant information about income and expenses. The JBLM Tax Center is in a new location on Pierce Ave. directly across from Gray Army Airfield. Parking is available behind the tax center and the administrative building -- Bldg. 6232. The tax center hours of operation are weekdays from 8 a.m. to 6 p.m. and Saturdays from 9 a.m. to 4 p.m. The tax center will be closed on federal holidays but will be open for business on Army DONSAs and Air Force Family Days from 8 a.m. to 6 p.m.
For more information, call the JBLM Tax Center at 253.967.1040.